tv-ooh: tv we like to watch on the tv: Paralympics opening ceremony: Nice apples, but where was the parachuting senior Royal? 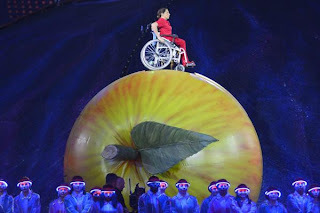 Paralympics opening ceremony: Nice apples, but where was the parachuting senior Royal? To be honest, we’re still not entirely sure what the opening ceremony of the Paralympics was all about, apart from the giant apples, but then that’s probably ok – sometimes it’s best just to sit back and enjoy the spectacle, even if that spectacle sometimes feels like a Pet Shop Boys concert with wheelchair users on enormous fruit and hundreds of umbrellas in the sky and something or other about ‘enlightenment’. It all looked like quite a good laugh, and the music was generally good, too - no George Michael single promotion here, cheers - even if at times the event's smaller budget seemed evident. Where was the parachuting senior Royal? Even so, it had enough moments to tick the boxes marked ‘humbling’, ‘inspirational’ and ‘Beverley Knight’, but right now tv-ooh’s main concern is that the many volunteers who did all the dancing - moving from side to side while the athletes entered the stadium in the procession, alternating moves of hand claps and hand rolls as they shuffled from one foot to the other like some sort of drug-crazed dance-bot, and bedecked in fetchingly attractive (ie not fetchingly attractive) purple trainers – are now getting the medical help they need. They must have been knackered. More annoying were the regular but frustrating advert breaks, or the occasional if forgivable commentary blunder by a much-better-than-Trevor-Nelson Krishnan Guru-Murthy ('Many of the athletes are here by accident'). But the adverts meant we sometimes missed seeing some of procession, and the chance to see the 164 participating country's names (like Ecuador, or Egypt - see Youtube clip below) written above a large umbrella, or the opportunity to hear about their possible engagement with civil war or terrorism via Channel 4 news presenter and occasional voice of doom Jon Snow. On one hand it’s good that Channel 4, as the UK’s only commercially-run public broadcaster, gets a chance to show how they can cover these enormous, one-off events, and unfortunately ad breaks are going to be something we'll have to get used to – but the fact that Channel 4 is a smaller channel than BBC One may mean its television audience turns out to be smaller too, and had the BBC had the tv rights for the Paralympics too, it may even have boosted the growing feeling of the Paralympics now being just as high profile and important as the original Games. It would be a shame if too few people watched the coverage, or were put off by the ad breaks, in what many are saying could be the biggest Paralympics yet - even though other broadcasters - for example, America's NBC - are only showing weekly highlights, rather than our continuous coverage. However, few could have predicted the enormous enthusiasm there seems to be now for the Paralympics – and as long as Channel 4 go easy on the Jon Snow, and also don't try to make it all T4 with irony-heavy youth presenters half-arsededly briefed by a hungover producer with an asymmetrical haircut - we’re hopeful for some strong coverage, some good tv, and lots of medals. We also hope that the main Channel 4 Paralympic studio stops being a claustrophobic orange box – let’s have a nice view of the Olympic park... or more of those giant apples. "Italians are gorgeous even in wheelchairs. Love 'em."